It is Monday today which means New Week – New Opportunities – New Goals. This week is quite busy. I am working six days including a 9 hour workday on Saturday. So yes, no weekend for me. Other than that I have to work twice as hard because I did not complete all of this weeks goal, especially not the big blogging goal. Lets (hopefully) start making some money online. I have two products in my store currently, but hopefully this will give me the push I need to really start getting things going. Again, I need to get the ball rolling here, and what do people like better than a sale? The reason I choose 30% is because of when we have items on sale at the store, they are usually 33.34% off, and I like round numbers. 3. 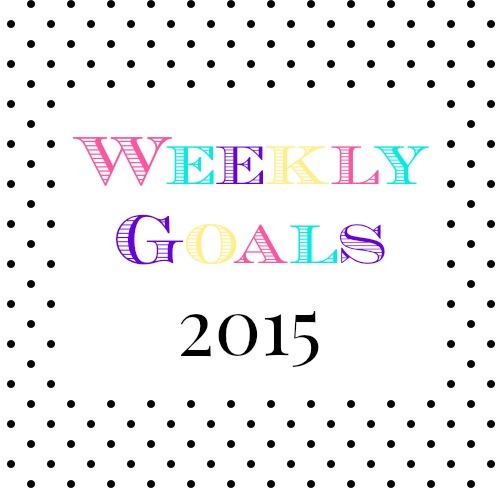 12 Weeks To Goals – work on daily. This is a new series I am a part of, and it is something I need to work on every day to be able to reach me goals and the end of the 12 weeks. This week is week 3/12. I need to work on getting stronger. I am running colour me rad in like three weeks and x-run in four. At least I hope it’s that long, time flies. I am nowhere near as in shape as I had hoped to be, but I will have to try. 5. Organize my bedroom and put old stuff for sale online. My bedroom is quite messy still, because I just have too much stuff. I have to go through my stuff, organize it, throw it away, donate it or sell it. I will have to take pictures of the things I want to sell and put them online (both on the norwegian craigslist-type of site and selling sites on Facebook). I did not finish any posts for August. The two days I really was planning on this my blog did not work on my computer. It happens more than I would like and is such a pain, but luckily it’s usually just me the problem is with, and not you (I hope!). I did plan the for the following weeks and wrote them down. I have printed the printable and put it under my desk pad, next to my to do list. I did however schedule 3x daily posts on fb for August. I did not really work on the 12 weeks to goals daily thing. I kinda checked in but nothing more. I added to soaps to my Epla store. My bedroom is still a mess. No surprises there. The weekend kinda just disappeared in blueberry picking and jam making, dog breed meeting and a bit of agility training. Oh and binge-watching series with my sister most of the time.